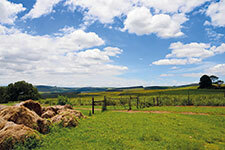 Set amongst the peaceful rolling foothills of the KwaZulu-Natal Midlands, Garlington Estate commands beautiful views of the lower Midlands countryside and offers a contemporary country lifestyle. The estate features a lifestyle centre, gym, restaurant, tennis courts, horse riding, driving range with local wildlife and Nguni cattle that freely wander the grounds. 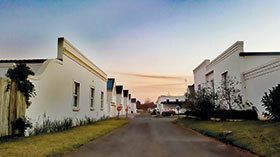 The estate currently comprises 300 homes with approximately 1200 people living on-site. Garlington recently made the decision to improve some of its security systems due to the growth of the estate, which made the old manual access control system ineffective for the estate’s needs. Garlington turned to Excellerate Services and Powell Tronics to assist in the upgrades. A strategic plan was developed after certain needs were identified by the estate in pursuit of a safer and more secure environment. Excellerate’s technical director, Glenn Allen, describes the upgrades as follows. 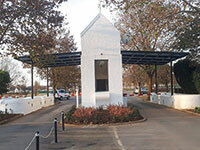 When it came to accessing the estate, a solution made up of Impro IXP 400 access control systems along with Morpho OMA520D biometric readers were selected to operate three-phase electronic booms and turnstiles at certain entrance points. The estate’s access points consist of the front entrance where there are two incoming lanes and one outgoing lane with a single turnstile for domestic staff. In addition to this, the contractors’ entrance occupies one incoming and one outgoing lane and also benefits from a single turnstile. Furthermore, there are three-phase electronic booms restricting access into and out of the East and West village. The estate’s visitor management system was also upgraded by integrating the PT Guest visitor management solution from Powell Tronics with the IXP400. The visitor management system makes use of Honeywell ID scanners for scanning visitor driver’s licences and vehicle licences. PT-Guest streamlines the access of visitors and contractors, and includes a reporting component that assists not only in keeping a record of who was on the estate and when, but also assists in investigations or when a record of transactions is required. The system also makes it easy to pre-authorisation of visitors via web or SMS. Powell Tronics was also responsible for the on-site training of Garllington’s staff to ensure their complete understanding of the new systems. The result was a more secure access control infrastructure and streamlined access for both residents and visitors entering and exiting the estate. Excellerate also installed 20 Hikvision IP cameras with 2.8 to 12 varifocal lenses for surveillance over the booms and turnstiles. The company also designed the estate’s control room and video wall, which consists of two 23-inch screens and two 32-inch screens for surveillance management, as well as a 23-inch screen for monitoring the fence and household alarms via Watch Manager software. All head-end and controlling equipment is housed in the control room, situated at the contractor’s entrance. An RDC base station was installed to monitor household alarms on the estate. An onsite response vehicle has been dedicated to respond to any home alarms as a free service to residents. Video management is handled by software from Cathexis, the CatVision Professional video management system. The set-up supports up to 150 cameras per site (64 per server). To improve perimeter security, 10 JVA Z 28 2-zone energisers we installed in order to create 20 zones along the fence, which are alarmed and monitored through Watch Manager. Apart from the security solutions, Excellerate also installed a new 5000 metre fibre-optic network to provide connectivity for all the electronic equipment and to provide a network infrastructure for future growth. The fibre was buried along the perimeter and also connects the main gate, contractors’ gate and the internal village booms back to the control room. All the solutions employed at Garlington are locally supported, and Excellerate’s employees are trained to maintaining the equipment in top working order. Both Impro and Cathexis have proven themselves as technology leaders in estate security and are used widely in this type of application.